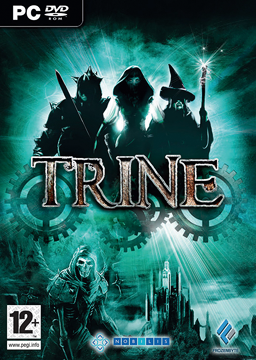 Thank you Frozenbyte for a copy of Trine for review! A wily thief sneaks into the Astral Academy, looking for legendary treasures. In it, she finds a mysterious object. A wizard remained in the near vacant Academy, who studies the skies. He is inspired to take a look around, and also finds this artifact. Meanwhile, a knight, who has been tasked to protect the Academy, also explores the place. The three of them find themselves all touching this artifact. Once this happens, they all disappear. The wizard then remembers that this artifact is called the Trine, which has the power to bind souls. Thus, their souls are bound together. Now, only one of them can be materialized at a time. As they look to free themselves from this Trine, they discover a deeper evil that needs to be taken care of, all the while dealing with the undead invasion plaguing the land. Trine is a very well done 2D side-scrolling action/platform game that successfully uses physics-based puzzles to challenge the player and make for some fun and creative running, jumping, swinging, and more. Each character brings a set of unique skills to the table, which makes them invaluable as well. Pontius the knight is the melee warrior of the bunch. When a swarm of skeletons come your way, especially from multiple directions, he\'s your man. He is skilled with sword and shield, and his brute strength can come in handy throwing heavy objects around. Eventually, he gets a very powerful mallet that most undead really aren\'t too happy with. On the other hand, when he\'s in the water he sinks straight to the bottom, and he has no way to get to strange high places other than jumping. Zoya, the thief, is the acrobat and archer. She can hit enemies from very far with her bow, though close up things can get hairy quickly. She can also eventually light her arrows on fire. Her really useful skill, though, is not in her weapon (though fire arrows are very nice) but in her acrobatic skill. She has this rope that she can throw, somewhat reminiscent of Spiderman, that can attach to any wooden surfaces. With this, she can pull herself up, or let herself down into many places that the knight could never reach, or would be quite challenging for the wizard. She is a lot of fun to play as, and quite valuable, so it\'s best to keep her out of sticky situations. Amadeus, the wizard, is probably the most interesting of the three. While killing undead is not an easy task (though not impossible - dropping items on them works), he can create objects out of thin air which can help immensely in trying to reach difficult places, trigger switches, or other environmental puzzles to solve. His creation repertoire includes boxes, planks, and eventually another powerful object. He can also levitate objects of almost any weight freely around the screen, whether he created them or not. This, along with some of the other character\'s skills, can make for some very creative puzzling. Interestingly, he never does learn the fireball spell every good wizard is supposed to know. Each character is given a back story, with appropriate personality traits to go with them. Amadeus never learned how to cast fireball because he spent too much time trying to impress the ladies. Pontius is our friendly, slow, happy glutton who likes his drink (the one reference to alcohol). Zoya is a very introverted person, and also the typical thief - she wants shiny things, and goes to great lengths to get them. While in many games the back story is mostly a placeholder, you really get to know these characters because of some very fine storytelling. In the intro sequences, you are charmed with the characters and their flaws, in a well choreographed video. While there are few other videos in the game, the voice acting between levels, and sometimes at special checkpoints throughout, is of absolutely excellent quality. I never had the desire to skip it when the loading screen was ready for my input, and indeed, I wished it went on longer. The narrator has a charming English accent, and he sets the stage for each level wonderfully, while also giving you a good feel for how the characters are doing. The character voices themselves are also excellently played out. The music is also quite enchanting. The quality does not end there, though. Not only is the audio fantastic, but the graphics are equally incredible. Now granted, I have a pretty high end PC so I can crank all of the graphics settings, but these have to be some of the best graphics I have seen on a 2D game anywhere. They are all 3D rendered 2D, with some just gorgeous environments to behold. There is a forward plane, where your character interacts, and multiple other depths into the background where you can see layer upon layer of your environment. There are ancient castles, luscious grasses, overgrown trees, flowing streams, underground caves, fiery furnaces, and even breathtaking rainbows to behold. I can\'t speak highly enough of the art direction here. It\'s done to excellent effect, and I am very pleased. All of this incredible polish on the art leads to a very enjoyable single player control system that\'s also very well done. You move around your environment with the common WASD keys, and jump with space. You use your mouse to use primary and secondary skills, like attack, block, extending your rope, or item creation and levitation. As you move through each level and solve puzzles, you gather bottles to gain experience or replenish your health and energy. You can also discover secrets. These secrets include additional powerful artifacts that can grant your characters additional armor, health, or skills. Many of them can be moved between characters on the character inventory screen. You can also allocate the skill points you gain on level up to various skills that each character can improve. These include things like shooting more arrows, doing more damage, or summoning more items into existence at a time. Given that the game is a platformer, I assumed that a gamepad would be the preferred control scheme, but not so. The PC classic keyboard and mouse combo works wonderfully here, as each character class has some way in which they benefit from the aiming capability of the mouse. The wizard has perfect accuracy in creating and levitating objects, the thief can aim her bow and rope perfectly almost every time, and the knight can aim his shield or swing his sword in any direction he likes. Walking and jumping work as well as you\'d hope using the keyboard, but it was the rest of each character\'s abilities that worked so much better than I expected. Setting up a gamepad is quite a bit more complicated than you\'d expect, and using my PlayStation 2 to PC USB adapter, it took a lot more work than I had ever anticipated to get things working just so. It took me a while to figure this out because there are several pages of controls, with some being for each character. And on top of that, getting a second analog axis for the wizard\'s abilities, or being able to aim the thief\'s rope was much harder than it had any right to be. In the end, I tried the gamepad mode for a few minutes, saw no real benefit, and went back to keyboard and mouse controls. It could be useful for multiplayer, though. Hopefully it works better on consoles, though other than the easy configuration, I\'m not sure how it would work better than the keyboard and mouse. There is no LAN or online multiplayer, but there is local multiplayer where each of the three characters can be played simultaneously. This can lead to some sticky situations that you don\'t have to deal with in single player. For example, that crazy escape by the edge of your teeth that you were able to pull off while playing alone may not work when you are in a group, because now both or all three of you need to cross that bridge together. Nevertheless, it\'s great that they offered this, and it changes up the game quite a bit. If you and your friends are keyboard and mouse die-hards, and don\'t want to use gamepads, this game doesn\'t leave you in the cold. This is one of the very few games that supports multiple keyboard and mice combinations. So you can have up to three keyboards and mice connected. This is great, but unfortunately, the implementation is slightly flawed. The game detects all of your keyboards and mice, and assigns them for you to players. This means that which keyboard or mouse goes to which player is decided by the game, not by configuration. Also, I believe it must have detected my unused PS/2 port, because my PS/2 keyboard was assigned to player one, my USB mouse was assigned to player two, my additional keyboard was for player two and the matching mouse for player three. There was nothing I could do about it, unfortunately. Too bad, it could have been fun. I also had to disable multiple keyboard and mouse mode for single player, since my main mouse was detected wrong. Another small gripe I have with this game is that there is very little enemy variety. There are bats, spiders, a few types of skeletons, a couple of bosses and mini bosses, and that\'s about it. While I never found it boring (the game mechanics are too much fun for that), fighting off the same enemies does get a bit repetitive. There are some appropriateness issues, but much less than I feared. There is magic in this game. You can summon objects, and levitate items at will. Each character has an attack that seems to be magic enhanced, like the knight\'s lightning hammer. Enemies are often magical in nature, especially the undead skeletons that frequent every level; the game calls this the \'dead rise to life\'. After the alcohol reference in the beginning, there was no other mention that I noticed. One area is called \'Crypt of the Damned\'. The female thief is reasonably covered. She is wearing short shorts, and the garment that covers her chest is like a large red bikini top, except with a much looser fit. But over all of this is a long dress-like garment that flows as you move, so you usually see only one leg at a time. While her curves there are noticeable, the outfit is not skin tight, and not done in an overly sexualized way. There is violence, in the form of killing undead, spiders, and bats. There is no gore. 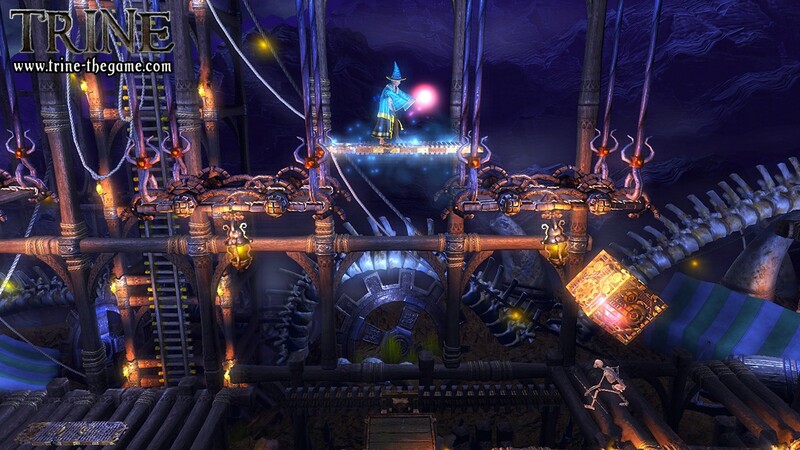 Trine is a game that I have had an eye on for a while, but never picked up. When Frozenbyte contacted us about a review copy, I jumped on the opportunity, and I am glad that I did. This is a game that, despite its flaws, is amazingly well polished, and a ton of fun to play while it lasts. I beat it in around ten hours, but it\'s a fun romp the whole time, and it makes you think, too. As with any game, always consider the content for your family, but I mostly agree with the ESRB rating in this case. But otherwise, this is a game I can heartily recommend.